Read Left: Dr. Susan Marthandan, Director, Hindustan College of Arts and Science; Dr. Mrs. Elizabeth Verghese, Chancellor, Hindustan Group of Institutions; Dr. Anand Jacob Verghese, CEO, Hindustan Group of Institutions handing a cheque to Thiru. Edappadi K. Palaniswami, Honourable Chief Minister of Tamil Nadu at Secretariat, Fort St. George. Cyclonic Storm Gaja was the fifth named cyclone of the 2018 Indian Ocean cyclone season. Gaja made a huge trail of destruction in the districts of Nagapattinam, Thanjavur, Tiruvarur, Pudukottai, Dindigul, Trichy, Karur, Sivaganga, Ramanathapuram, Cuddalore in Tamil Nadu and Karaikal in the Union territory of Puducherry. At least 50 people were killed, over 100 cattle and 600 goats were also killed in the cyclone. About 250,000 people were evacuated to relief camps. More than 117,000 houses, including thatched huts and tiled roof houses were damaged. As a mark of our solidarity with the victims of Gaja cyclone, and expression of condolences, Hindustan Institute of Technology and Science and Dr. K.C.G. 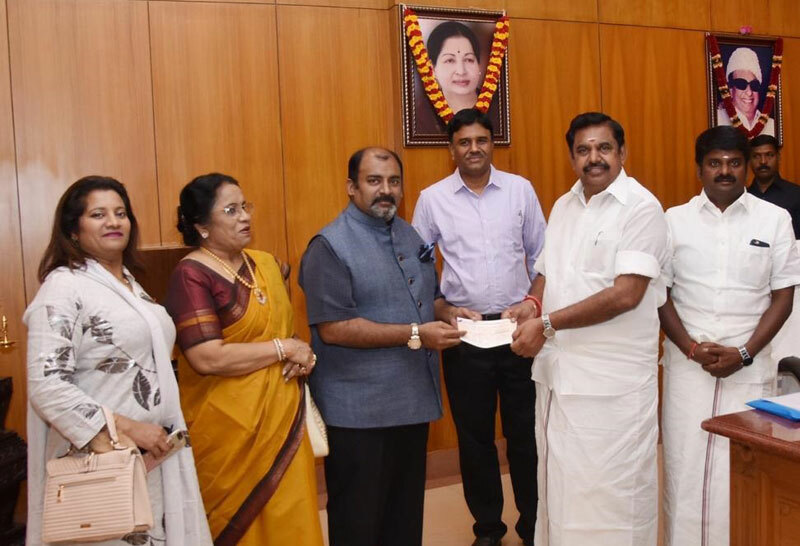 Verghese Foundation made a monetary contribution worth Rs.25 lakhs towards the Chief Minister Relief Fund for expediting the process of relief work and restoring normalcy to the victims.